An Ode To Puran Poli, That Fickle Mistress! 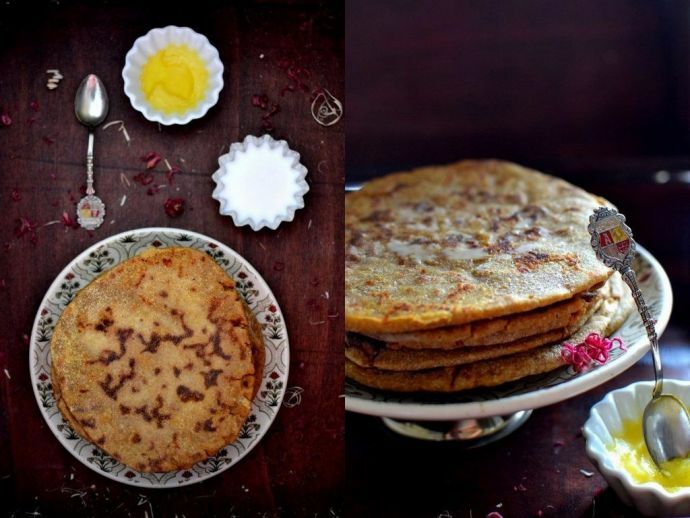 AKA my (mis)adventures with attempting the quintessential Maharashtrian sweet pancake. It’s that time of the year again. And the groomed-since-birth ideal Marathi Mulgi in me resurfaces to take charge of upholding age-old traditions (because my mother, after doing it for over four decades, has hung up her apron, quite literally). An essential element of this glorified burden is the preparation of the sweetbread Puran Poli, a staple on all occasions in Maharashtrian households, even more so on Holi. It is not coincidental that the two rhyme, you see! Puran Polis are regarded with a polite affection, even reverence, because they are considered fairly difficult to get right. The puran poli, known by many names like holige, bobbatlu, and boli, depending on where in Central or South India you find yourself, is a treasured delicacy. Often the test of a woman’s culinary talent, it can make or break your reputation as the go-to lady for all things gastronomic. If you care about that sort of thing, that is. My mother is one of those people whose dishes could get them their own Geographical Indicator tag. Her puran polis, and those made by other gifted women on her side of the family, are the stuff of legends. I have grown up listening to stories about how my mother prepared a perfect batch of this dessert for her school fete, when she was barely a teenager. I have heard paeans sung about an aunt of hers who could make puran polis a foot in diameter without using a rolling pin. The mental image of a nauvari-clad, nath-sporting matriarch juggling a puran poli on her bare hands like an Italian chef handles a pizza base, pops out of nowhere. Then there is my ex, whose hometown boasts of these breads prepared on an upturned earthen pot, like a sweet rumali roti. And if these myths seem a little too fantastic to you, you only have to sample a puran poli from a kitchen novice to realise just how wrong they can go. Standing on the shoulders of these Annapurnas, or goddesses of the kitchen, I embark upon the unenviable task of beginning with the Puran, or the chana daal filling. Once pressure-cooked, the chana dal has to be simmered with an equal amount of sugar or jaggery (yes, THAT much). The sugar melts to form a glaze over the daal, and that’s where the fun begins. The caramelized daal, now heated, starts bubbling like a confectionery volcano of sorts. It looks like something straight out of Willy Wonka’s Chocolate Factory- sugary, smooth, and potentially fatal. The volcano spits out its delicious lava from time to time. The fiery drops that fly out, don’t discriminate between your arms and your eyes. There is no escape. All you can do is toughen up and keep stirring, or the daal will stick to the bottom of the pan- a strict no-no. Once the syrupy daal is prepared, I add the fragrant cardamom and nutmeg powders. The heady scent is carried across the house, signalling the family that Paradise is nigh. The person cooking, however, is thinking of a different kind of Heaven. Then comes a job that requires some serious elbow grease. The daal is still lumpy, and needs to be smooth for filling. 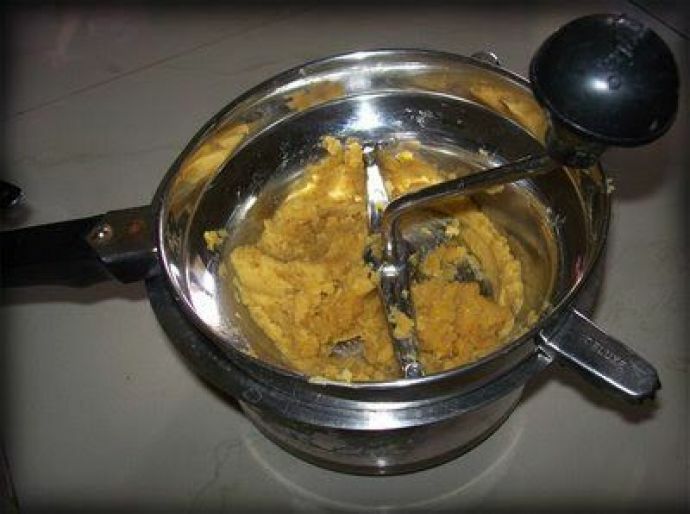 Out comes the puran grinder, a rather intimidating looking piece of equipment found in almost every Marathi home. The grinder is operated manually, and the more you delay grinding your puran, the stickier it gets (thanks, chemical properties of sugar) and the tougher grinding becomes. So I ladle out the piping hot daal into the machine, and get cracking. Essentially like a stone mill in design, the grinder has a hand crank that needs to be rotated to obtain mashed puran. And you rotate it like there is no tomorrow. As you rotate it your arm muscles scream out of months of hibernation, and you cannot switch hands because it just doesn’t work that way. The fact that you are a clumsy sloth like me also doesn’t help. You only think of the women of yore who’d do it on a stone mortar and pestle, and thank stainless steel manufacturers for this contraption. Even so, the grinding is done. The smooth, lumpless puran has been extruded out like manna from the Heavens and the residue around the grinder has been licked clean (hey, I deserve that!). The following part is relatively simple, though no less of a challenge. The puran is filled into a rolled out wheat roti, and roasted with copious quantities of ghee. 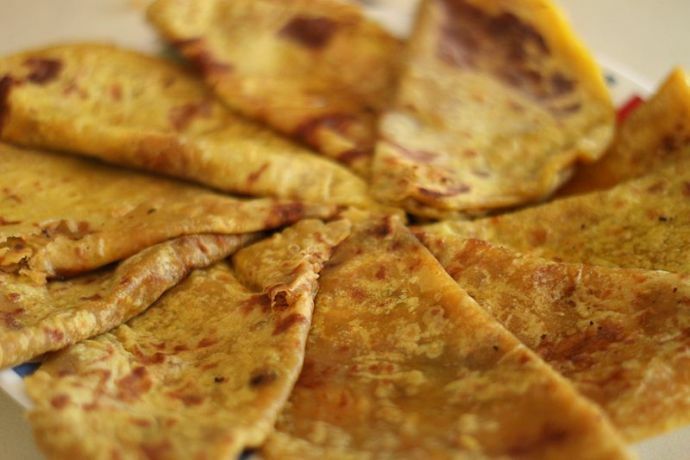 Plain old paranthas, you’d say. But this is where the skill of the chef stands out. The roti can’t be too thick or the puran poli will be doughy. It can’t be too thin or the puran, fickle spirit that it is, will spill out and create a sticky mess. The dough shell can’t be too flaky or crisp, or it simply ruins the texture. As I type this, the puran I prepared is cooling off, awaiting its final destination inside a dough blanket- which I am apprehensive about. My rotis usually look like an amorphous cloud, but I pray to the many puran poli mavens, whose DNA I carry, to bestow me with some talent today. 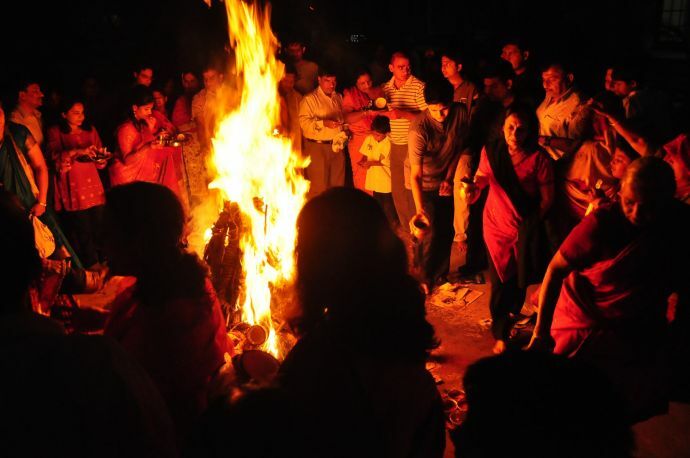 It remains to be seen tonight if only a token piece of the Puran Poli, or the entire batch I made, ends up as offering into the Holika bonfire. Wish me luck!